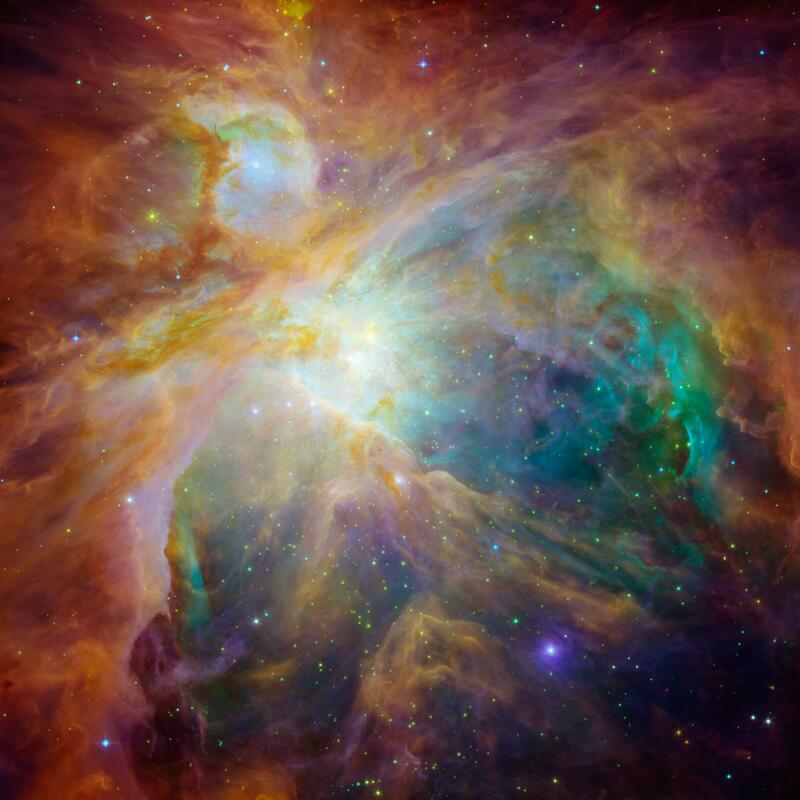 NASA's Spitzer and Hubble Space Telescopes have teamed up to expose the chaos that baby stars are creating 1,500 light-years away in a cosmic cloud called the Orion nebula. This striking infrared and visible-light composite indicates that four monstrously massive stars at the center of the cloud may be the main culprits in the familiar Orion constellation. The stars are collectively called the "Trapezium." Their community can be identified as the yellow smudge near the center of the image. Stellar winds from clusters of newborn stars scattered throughout the cloud etched all of the well-defined ridges and cavities in Orion. The large cavity near the right of the image was most likely carved by winds from the Trapezium's stars. Located 1,500 light-years away from Earth, the Orion nebula is the brightest spot in the sword of the Orion, or the "Hunter" constellation. The cosmic cloud is also our closest massive star-formation factory, and astronomers believe it contains more than 1,000 young stars.